It's uncanny. 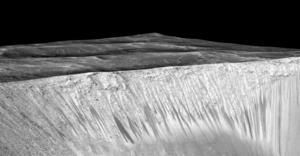 Dark finger-like streaks form on dozens of Martian crater rims and hillsides as local spring warms into summer. The streaks lengthen down the slopes until summer's height, then stop growing and fade as fall comes on. What causes these seasonal streaks has been a mystery since they were first discovered in 2011. Most scientists have assumed the seasonal streaks — known as recurring slope lineae, or RSLs for short — form as summer temperatures melt buried ice near the tops of the slopes, and the water flows downhill making dark streaks. Later in the year, as temperatures drop, the flow halts and the dark streaks fade as dust falls out of the atmosphere to cover them. Supporting this idea were observations that the streaks contain hydrated salts. Now a discovery made using an instrument operated at Arizona State University's School of Earth and Space Exploration throws strong doubt on this "wet streak" model for RSLs. "We used a very sensitive technique to quantify the amount of water associated with these features," said Edwards. "The results are consistent with no moisture at all and set an upper limit at 3 percent water." 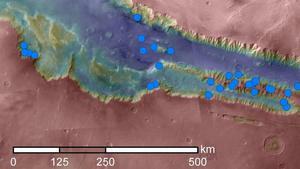 Edwards and Piqueux analyzed several Mars years of THEMIS infrared observations of RSLs within the large Valles Marineris canyon. The area has many RSL features close together in parts of the study region. The researchers compared nighttime temperatures of patches of ground — one covered to about 44 percent by RSLs, and the other on nearby slopes having no RSLs. 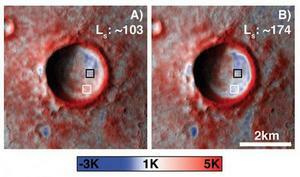 They found no detectable temperature difference, even during seasons when the RSLs in the crater were actively growing. The observations have an error margin of 1 degree Celsius, or 1.8 degrees Fahrenheit. Calculating the maximum possible water that could be concealed in that temperature difference led them to the 3 percent upper limit for water. "These results show that THEMIS has a unique way of measuring the water content of RSLs," said Philip Christensen, of ASU's School of Earth and Space Exploration. He is the designer and principal investigator for the THEMIS instrument. "Water in the soil has a strong effect on the surface temperature of that soil. So measuring the temperature accurately can put tight constraints on the quantity of water the soil holds," he explains. Edwards notes that some type of water-related activity at the uphill end still might be a factor in triggering RSLs. "But the darkness of the ground is not associated with large amounts of water, either liquid or frozen," he said. "Totally dry mechanisms for explaining RSLs should not be ruled out." Water won't flow at Martian temperatures, even in sun-facing slopes in summer, unless it contains some salt: a brine, in other words. Research published in 2015 found hydrated salts in the surface composition of RSL sites, and these salts increased during the season when streaks are active. Hydrated salts hold water molecules affecting the crystalline structure of the salt. "Our findings are consistent with the presence of hydrated salts, because you can have hydrated salts without having enough to affect the measured seasonal temperature," Edwards said. "Salts can become hydrated by pulling water vapor from the atmosphere, with no need for an underground source of the water." But the scientists point out that if RSLs were seasonal flows of briny water followed by evaporation, there would be an annual buildup of crust-forming salt, and this should affect temperature properties. So the lack of a temperature difference between RSL slopes and non-RSL slopes is evidence against evaporating brines. Another theory for RSLs has proposed that they are mini-landslides of dry material with different thermal properties than the pre-existing slope material. Such might be the case with annual avalanches of powdery dust that accumulates from dusty air. But again the lack of a temperature difference argues against this. In the end, the mechanism that causes RSLs remains unknown. 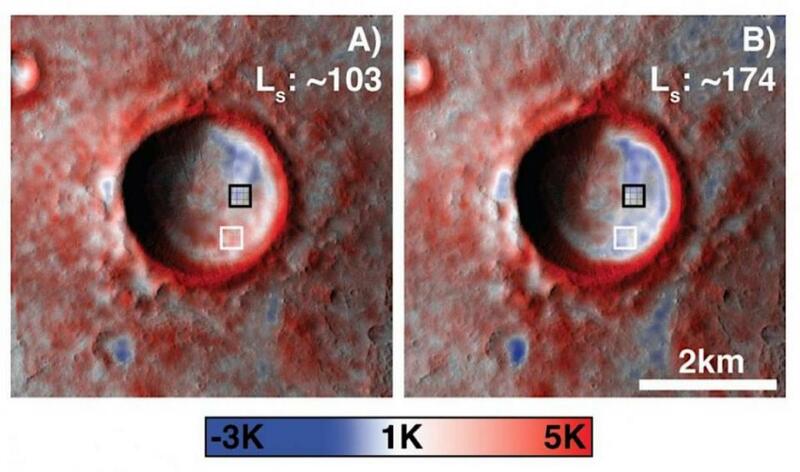 But Christensen said the discovery that RSLs are extremely dry has wider implications besides pointing the way forward for scientists as they try to understand how these features form, grow and fade each Mars year. 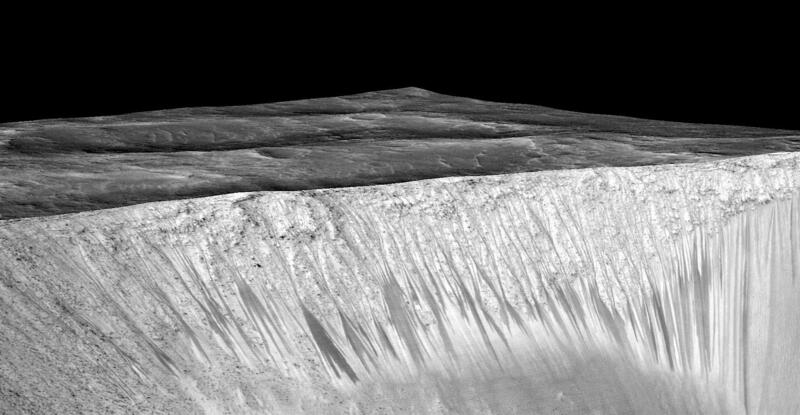 "By constraining the amount of water they contain — and by placing a very low upper limit on it — the THEMIS results help scientists determine how likely these seasonal streaks are as habitats for possible Mars life," he explained. "Because RSLs are so dry," Christensen continued, "that makes them much less likely to be habitats for life." Although this may be disappointing to researchers, he said, "It means missions to Mars designed to find biological traces and other markers for life could remove RSL sites from their target list." Thin, dark streaks appear every Martian summer and crawl down the inside rim of Garni Crater and numerous other hillsides on Mars. Scientists using the THEMIS instrument operated at ASU have just discovered the streaks are not caused by flows of water, as scientists have thought. Instead the streaks are extremely dry, and their cause remains unknown. 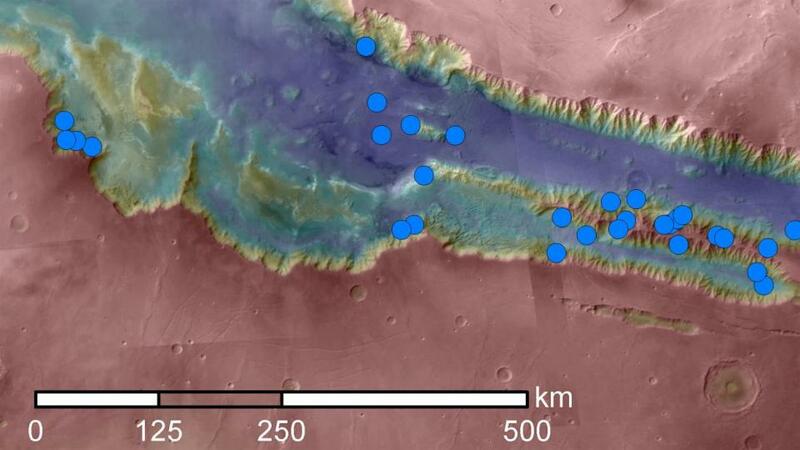 Blue dots mark locations within the Valles Marineris canyon network where seasonal dark streaks occur. This area has the highest density of these streaks on Mars. THEMIS temperatures at Garni Crater show a seasonal change between the RSL-rich white square and the non-RSL black square which is at most 1 degree Kelvin (1.8 degree Fahrenheit). The left image is in summer; the right is at the start of fall.